webdesigner, android app developer, problogger, system engineer, windows related tips and tricks! You're working away at your computer when suddenly, up comes an error message – or worse, your computer comes to a screeching halt. Deciphering what computer problems you have and how to fix them can be difficult, especially if you don't know as much as you'd like about your PC. Here are five common computer problems that "system repair software" can help you fix. Many people think of blue as a calming color; however, when it comes up on your computer screen with a bunch of white text, it probably has the opposite effect. The blue screen of death (BSoD or STOP Error) may appear to be one of the scariest computer problems you'll come across. However, all your computer may need is for you to reboot it. This STOP error appears on your screen for a variety of reasons: failing hardware, damaged software, corrupt DLL files, problems with drivers and more. The remedy for a blue screen of death depends on the original problem. The screen provides you with codes that can help you identify and fix your computer problems. Dynamic-Link Library (DLL) files house information for your operating system on how to perform certain functions. Occasionally, your computer loses DLL files or something damages them. When your PC can't read the particular DLL file, it doesn't know how to respond in certain situations. You may have a missing or corrupt DLL file if you receive an error message every time you perform a certain function, such as saving. If your computer problems are stemming from missing and damaged DLL files, you can restore them by downloading them back onto your PC. If you're having trouble with an application not installing, it may be because your computer doesn't have enough hard drive space. If this is the case, you need to free up some space. This is one of the computer problems that's, well, least problematic. You can free up some hard drive space by getting rid of files and folders you don't need. These may be temporary files, duplicate files or data for software you've uninstalled. There are several reasons software might be running at turtle speed. You may have computer problems that involve your operating system or an application, your operating system might be missing updates or your computer doesn't have enough hard drive space. If you don't have enough hard drive space, you can scan, clean and optimize your hard drive. Computer problems that involve applications acting strangely oftentimes leave you wondering what has happened. Your application has been working just fine, but now, seemingly without reason, it is doing something strange. For instance, your Word document will no longer show the top margin of your document. It still says it's there, and when you print it, there's not a problem. You just can't see it on your monitor. If this is happening, you may want to restart your computer. Conducting an internet search for the type of problem you're experiencing or consulting your user manual may help you as well. If you have computer problems, chances are, system repair software can help you fix it. Most of these applications can repair operating system problems that lead to the Blue Screen of Death. They can also replace missing or damaged DLL files. System repair software can also free up space you need for another application, and it can optimize your computer so it runs faster. It may even identify problems you're having with applications, but it depends on the software you use and the application that's having problems. 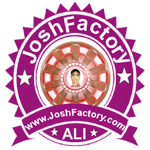 JoshFactory - जोशफैक्टरी webdesigner, android app developer, problogger, system engineer, windows related tips and tricks!